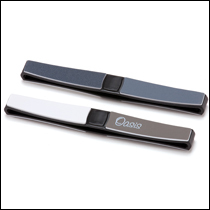 For classical guitarists, or guitarists who play fingerstyle with nails, the Oasis® Nail Shaper for Guitarists is a must-have tool. Four shaping surfaces, from coarse to super smooth (320, 600, 1200, 3000 grits), rest on foam pads mounted on a curved hard plastic base, allowing you excellent control to shape your nails just the way you want. This is much more effective than plain foam shapers. I have never used a shaper that has done a better job!